Unique pattern and color make this pervious concrete pad stand out. Concrete Producer Pennsy Supply Co. The Lebanon County Conservation District has installed several facilities around the Lebanon Valley Agricultural Center campus that help mitigate the effects of storm runoff from impervious surfaces by capture and reuse, or, by somewhat replicating the natural system of rainwater infiltration. 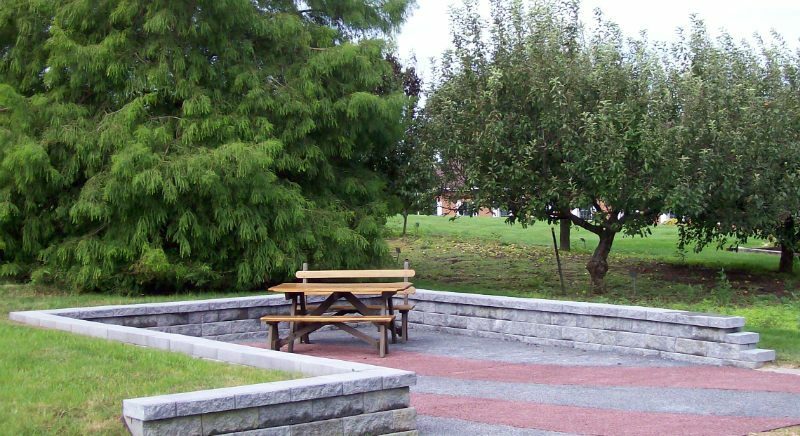 One of the facilities that replicates the natural system is a pervious Portland cement concrete picnic pad located behind the Center. 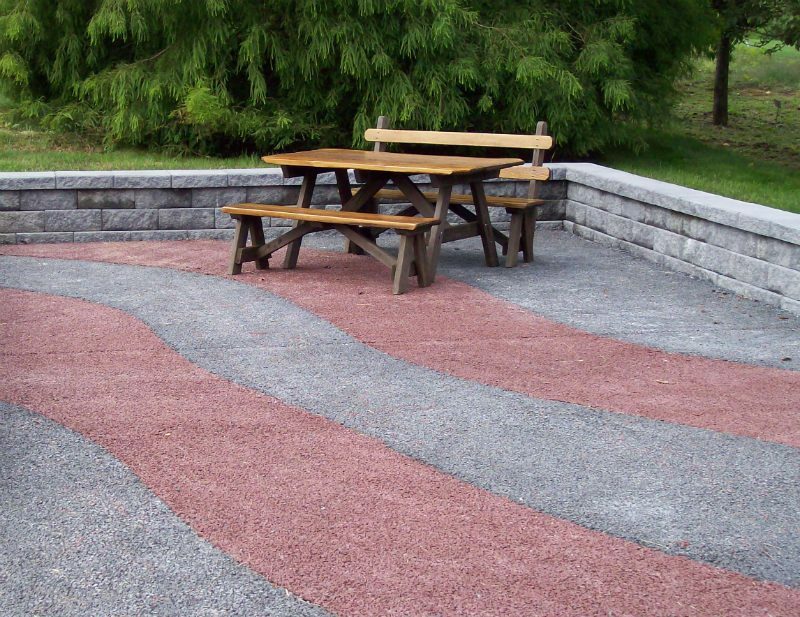 In an attempt to show property owners, contractors, and designers, creative yet practical ways to address runoff from impervious areas, the Lebanon county conservation district designed a fairly unique two color pervious picnic pad. After forming the basic rectangular footprint of the pad the concrete contractors, Engelman Construction and Evans Construction, utilized flexible vinyl forms to delineate the two colors. The dark gray concrete was placed the first day. 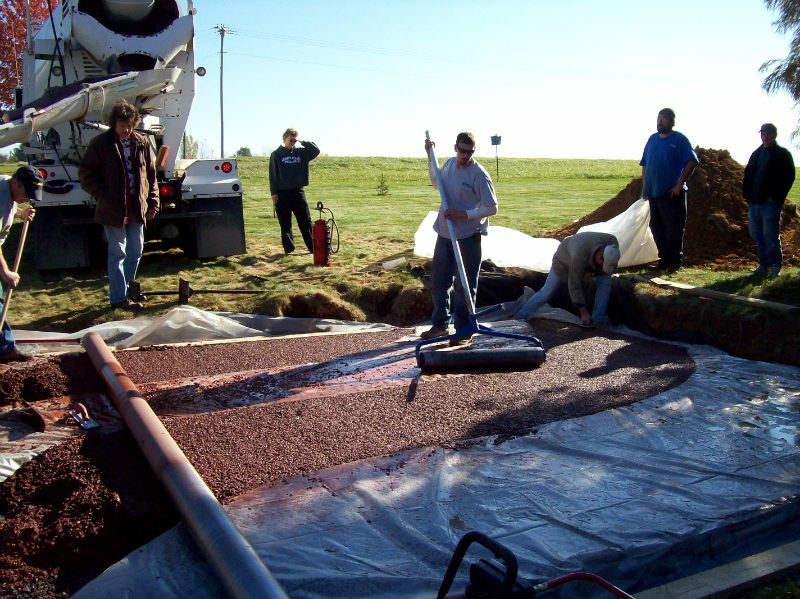 The second day the contractors placed the red concrete. It creates a nice visual effect. The picnic pad functions as a decorative concrete area for staff to enjoy their lunches while demonstrating that pervious concrete can be designed and placed to be aesthetically pleasing. The public is free to view these facilities and ask questions during normal business hours. Contact Karl Kerchner (717-272-3908) with any questions. Concrete, It Just Makes Cents!